• For quantitative determination of calcium ion Ca2+ and evaluation of drug effects on calcium metabolism. • Sensitive and accurate. Use as little as 5 μL samples. Linear detection range 0.08 mg/dL (20 μM) to 20 mg/dL (5 mM) Ca2+ in 96-well plate assay. • Simple and high-throughput. The procedure involves addition of a single working reagent and incubation for 3 min. Can be readily automated as a high-throughput assay for thousands of samples per day. • Improved reagent stability and versatility. The optimized formulation has greatly enhanced reagent and signal stability. Cuvet or 96-well plate assay. • Low interference in biological samples. No pretreatments are needed. Assays can be directly performed on raw biological samples i.e., in the presence of lipid, protein and minerals such as magnesium, iron and zinc. • CALCIUM is measured to monitor diseases of the bone or calcium regulation disorders. 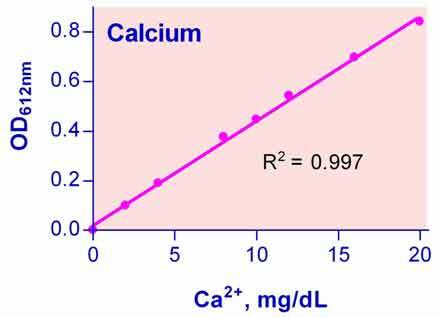 Increased calcium levels in serum are reported in hyperparathyroidism, metastatic bone lesions and hypervitaminosis, while decreased levels are observed in hypoparathyroidism, nephrosis, rickets, steatorrhea, nephritis and calcium-losing syndromes. Urinary calcium levels aid the clinician in understanding how the kidneys handle calcium in certain diseases of the parathyroid gland. Urinary calcium levels are also essential in the medical evaluation of kidney stones. Simple, direct and automation-ready procedures for measuring calcium concentration in biological samples are becoming popular in Research and Drug Discovery. BioAssay Systems calcium assay kit is designed to measure calcium directly in biological samples without any pretreatment. A phenolsulphonephthalein dye in the kit forms a very stable blue colored complex specifically with free calcium. The intensity of the color, measured at 612 nm, is directly proportional to the calcium concentration in the sample. The optimized formulation minimizes any interference by substances such as magnesium, lipid, protein and bilirubin. 1. We have whole blood samples. Does your assay work? Yes, our QuantiChromTM Calcium Assay Kit (DICA-500) can be used on whole blood samples. To correct for interference in the sample matrix, two internal standard methods have been validated. Protocol A is quicker whereas Protocol B is slightly more involved, but requires less sample and is, thus, recommended for customer's that have a limited quantity of sample. Additionally, protocol B requires less Reagent because each sample requires one well rather than three separate wells per sample. Please note that 20 mM EDTA is needed for this experiment and is not provided. The customer should prepare this solution, or is available for purchase upon request. A1. Whole Blood samples require an internal standard and need three separate reactions: 1) Sample plus Standard 2) Sample alone and 3) Sample Blank. For the internal standard prepare 250 µL 10 mg/dL Ca2+ Standard by mixing 125 µL 20 mg/dL Standard and 125 µL dH2O. Transfer 5 µL whole blood sample to three separate wells. Add 5 µL of 10 mg/dL Ca2+ to the 1) Sample plus Standard well, 5 µL dH2O to 2) Sample alone well and 5 µL 20 mM EDTA to 3) sample Blank well. A2. Add 200 µL Working Reagent and tap lightly to mix. Note: If any particulates or turbidity are seen pipette up and down to dissolve. A3. Incubate 3 min at room temperature and read optical density at 570-650 nm (peak absorbance at 612 nm). B1. Dilute standard to 10 mg/dL Ca2+ by mixing 125 µL 20 mg/dL Standard and 125 µL dH2O. B2. Transfer 5 µL whole blood sample to a well. B3. Add 200 µL Working Reagent and tap lightly to mix. Note: If any particulates are seen pipette up and down to dissolve. where ODSAMPLE, ODBLANK, and ODSTANDARD are the OD readings of the Sample, Sample Blank, and the Sample plus Standard respectively, 10 is the concentration of the standard in mg/dL, and n is the sample dilution factor. If the calculated calcium concentration is greater than 10 mg/dL, dilute sample in dH2O and repeat assay. Multiply result by the dilution factor n.
One human blood sample was assayed using the two methods. The Ca2+ concentration was 8.48 mg/dL using Protocol A and 8.38 mg/dL using Protocol B. 2. Is the calcium assay compatible with acids? Yes, our QuantiChromTM Calcium Assay is compatible with acids, such as 0.5 M HCl. 3. Do you know if phosphate in the sample will interfere with the calcium assay or if calcium in the sample will interfere with the phosphate assay? Phosphate (at least up to 30 mM) in the sample does not interfere with the calcium assay. 4. Does freezing of serum have any impact on serum Ca compared to using fresh serum? Our assay kit measures the total calcium content of samples. In serum about half of the calcium is free ("ionized") and the other half is bound to proteins, especially albumin (~40%) or anions (~10%). Repeated freeze-thaw cycles may cause precipitation of proteins which would alter the outcome of the assay. We recommend avoiding repeated freeze thaw cycles for serum samples. 1. Brand, A et al (2009). Calcium homeostasis is required for contact-dependent helical and sinusoidal tip growth in Candida albicans hyphae. Mol Microbiol. 71(5):1155-64. Assay: Calcium in Cow Serum (Pubmed). 2. Koreckij, T et al (2009). Dasatinib inhibits the growth of prostate cancer in bone and provides additional protection from osteolysis. Br J Cancer.101(2):263-8. Assay: Calcium in Mouse serum (Pubmed). 3. Chanda, D et al (2008). Systemic osteoprotegerin gene therapy restores tumor-induced bone loss in a therapeutic model of breast cancer bone metastasis. Mol Ther. 16(5):871-8. Assay: Calcium in Mouse serum (Pubmed). 4. Ou, KL et al (2010). Effects of the nanostructure and nanoporosity on bioactive nanohydroxyapatite/reconstituted collagen by electrodeposition. J Biomed Mater Res A. 92(3):906-12. Assay: Calcium in Human mesenchymal stem cell (Pubmed). 5. Zarjou, A et al (2010). Ferritin ferroxidase activity: a potent inhibitor of osteogenesis. J Bone Miner Res. 25(1):164-72. Assay: Calcium in Human osteoblasts cell (Pubmed). 6. Ponda, MP et al (2010). Moderate kidney disease inhibits atherosclerosis regression. Atherosclerosis.210(1):57-62. Assay: Calcium in Mouse serum (Pubmed). 7. Jung, GY et al (2010). Effects of HA released calcium ion on osteoblast differentiation. J Mater Sci Mater Med. 21(5):1649-54. Assay: Calcium in Mouse 3T3 cell (Pubmed). 8. Chaumet-Riffaud, P et al (2010). Synthesis and application of lactosylated, 99mTc chelating albumin for measurement of liver function. Bioconjug Chem. 21(4):589-96. Assay: Calcium in Mouse liver tissue (Pubmed). 9. Henderson, JA et al (2008). Concurrent differentiation of marrow stromal cells to osteogenic and vasculogenic lineages. Macromol Biosci. 8(6):499-507. Assay: Calcium in Human marrow cell (Pubmed). 10. Warotayanont, R et al (2008). Leucine-rich amelogenin peptide induces osteogenesis in mouse embryonic stem cells. Biochem Biophys Res Commun. 367(1):1-6. Assay: Calcium in Mouse stem cell (Pubmed). 11. He, X et al (2008). Effect of grafting RGD and BMP-2 protein-derived peptides to a hydrogel substrate on osteogenic differentiation of marrow stromal cells. Langmuir. 24(21):12508-16. Assay: Calcium in Human marrow cell (Pubmed). 12. Villa-Bellosta R, Sorribas, V (2009). Phosphonoformic acid prevents vascular smooth muscle cell calcification by inhibiting calcium-phosphate deposition. Arterioscler Thromb Vasc Biol. 29(5):761-6. Assay: Calcium in Rat muscle cell (Pubmed).